Large green walls are spectacular. But how do you keep them that way? Green walls are available in all shapes and size these days. They have a positive effect on the air quality and the surrounding atmosphere. For the construction of such walls there is usually a budget is planned. Maintenance however, is much less thought about. Yet it’s essential to make sure these walls keep looking good for quite some time. Depending on the type of wall, maintenance can be rather simple. Yet for some walls we have to rise to great heights…. Smaller walls can usually be made from one piece. Walls that are larger than two square meters often consist of multiple segments; so constructing them in various shapes and sizes is possible. 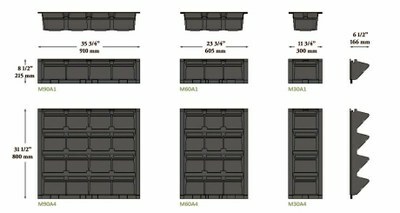 One segment – or module – is a frame or construction made of sturdy plastic pots, containing the substrate in which the plants can grow. Another possibility is a sort of mat or structure on which textile sacks are fastened where the plants are put in. This method is somewhat more fragile. Green walls can be irrigated with various watering systems that can be partly or completely automated. Or you can water the plants by hand. With an automated watering system it’s important that you also have a maintenance contract with the supplier, so it can be checked regularly and fixed, if necessary. Hose, pump and gutters need to be kept clean to prevent clog-ups. Turning the water supply up or down, in summer or wintertime respectively, is also needed because the demand and the amount of evaporation differ with each season. If the plants are watered by hand, the construction will also need maintenance but simpler. Choosing the right watering system depends on the size of the wall, the water supply and the substrate system that is used. Checking the system once a month is advisory. Large green wall in Hendrik Ido Ambacht. Actual plants need additional maintenance, besides watering. Adding fertilizer, trimming, periodical renovation and preventive and curative care also need to be taken care of. 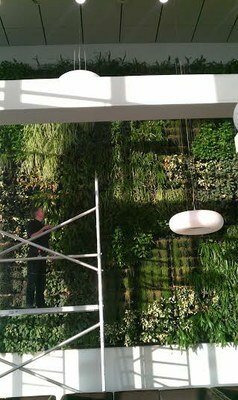 Maintenance is essential to keep the green wall in perfect condition for a long time. Depending on the type and the size of the wall, this needs to be done from four to twelve times per year. Sometimes people think, “Let nature go its course; the greener the wall, the better” or “we can manage giving a little bit of water and if we do it ourselves, it will save money.” Of course, this could work for a couple of months, but the consequences become apparent soon. The plants in the wall tend to overgrow each other. Regular pruning is needed for a balanced growth, ensuring the plants will keep for a long period. Timely and professional monitoring and treating pests and plagues is also important. This will keep a check on the costs. 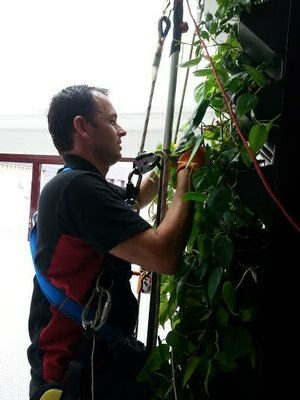 Green walls measuring three metres in height can be taken care of with a ladder. For higher walls you will need scaffolding or a cherry picker. With leaning walls or other walls where you can’t use both, mountain-climbing gear could be the ideal means for tending to the plants. There are even green wall systems that include a rail and a gondola hanging from it. Please note that these should to be used only by well-trained and experienced maintenance professionals. Is there enough space underneath the wall to install a scaffolding or hydraulic gear for maintenance? Is there enough room above the green wall for the construction of to fasten climbing gear? In short: make sure to involve an interior horticulturalist in the process as early as possible. This should be someone who is specialised in constructing and taking care of green walls. He or she can also advise on the total costs, including the up-keep, and is clear about the guarantees. 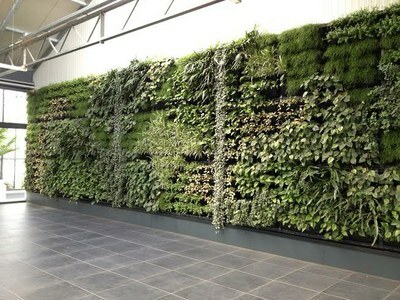 This ensures your green wall will remain a spectacle for a long time.